Make sure that both the husband and wife have keys to the mailboxes. I had to overnight our keys to dear husband since I had been out of town for a while. Good thing I did since we had a package in the box. Sometimes the ‘kids’ have to become the ‘parents’ to their parents. My mom has always lived in her own house independently, but it became obvious a few weeks ago that it wasn’t the best idea anymore. So, the last few weeks I have been trying to help my mom move into a Senior Living place near us. When she is all settled I will post an update. Dogs (especially Pepper the Golden Retriever) sense when a person is older and needs some company. My mom has been at our house for the last week and Pepper will bring her toys, sleep at her feet and is very gentle and loving to her. Now, that doesn’t mean that Pepper still doesn’t love to be hyper and run around, but it means she tries to not do it near my mom. Plan for natural disasters. We recently had a horrible wind storm. The worse part was we were out of power for 27+ hours. We have a well which meant we could not pump water. I am happy that we had gallon bottles of drinking water in the garage, used the water in the hot tub (which had dirt and leaves blown into it) to flush the toilets and we were able to use our wood stove to heat food and drinks once the wind died down. We know multiple people that lost part of their roofs (and/or trees). Do you have an emergency stash / plan?? Love and appreciate your family since you never know how long anyone will live (this one should be obvious). I have been having a conversation with my mom this week since she is trying to figure out why she is still alive, but her parents, sister, brother, friends and two husbands have all died (and most of them at a younger age than her). The only thing I keep saying is ‘God decided a long time ago the number of days you will live.’ I hope I am loving and honoring to my mom for the rest of her days. If you see a problem then take action – I am so glad that I didn’t ignore the signs that my mom was having difficulties (or come home when she just told me to leave her in her house). After having a doctor evaluate her (and having her eat good food and drink water) we determined that mom needed to be on medicine. Once she started to take it she remembered that she used to take it ‘years ago’, but for some reason she stopped. My family is noticing an improvement in my mom since she has arrived. Housecleaning can wait – I am not saying to completely blow it off, but I have realized that my mom needs my attention also while she is here. So, I have been randomly doing house work and trying to recover from being gone for over a week. I hope all of you (in the United States at least) had a great 4th of July. We worked around the yard (fixing sprinklers, etc), taking Pepper (the Golden Retriever) for a swim in the river, eating BBQ’ed ribs and squash and went to see fireworks. The sad part is the fireworks started a small brush fire. Hoping we have as much fun during the rest of the weekend. Hi, all. Well, I am late, but here is the photo of the Subway art (see previous post on how I created it) I created using words that describe Pepper (the Golden Retriever). After the last couple of weeks taking Pepper to water I realize I should make this again and make the word ‘Swimming’ HUGE!!! This last weekend we took her to a lake. The husband planned on shore fishing also. Well, he did catch three trout, but he would have caught his limit if Pepper hadn’t decided she had to continually swim (and sometimes got into his line – oops). What is amazing to me is Pepper swims after floating toys, but also will just run back and forth in the shallow water AND will also just start randomly swimming into deeper water (luckily she doesn’t like us getting too far away so if we don’t call her she will turn around and look for us). Pepper officially turns two years old on Tuesday (1 July) so I will definitely be posting some new photos. So, for a present I decided I wanted to make the husband a Subway Art using some of words of his favorite things. First I was looking at making a Canvas Artwork, but ran into problems getting the words to fit correctly on PicMonkey ( http://www.picmonkey.com/ ). I use this site to add the Watermark (blog name) to the photos I own and post. So, then I started doing some Google searching to figure out how else I could make a Subway art. 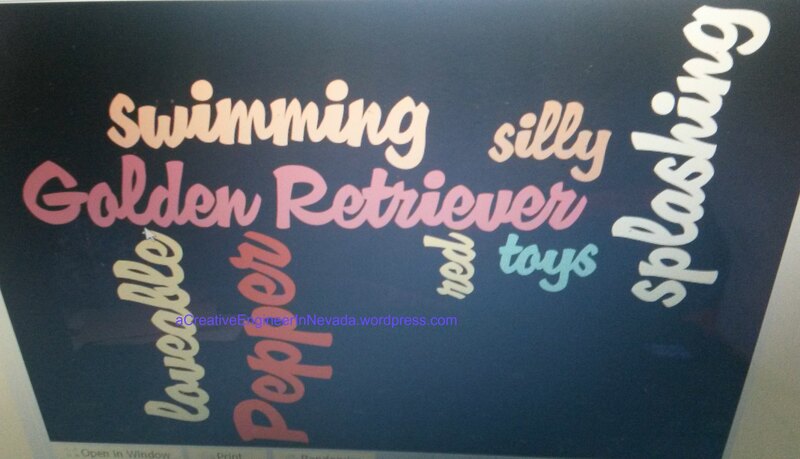 I found a few references to Wordle ( http://www.wordle.net/ ). It is a pretty easy site to use (I do suggest you read their FAQs before you start out). I did save my word list in a document first so it was pretty easy to modify. I was able to make and print out my personalized Subway art (in black and white) this morning – now I need to put it into a frame so I can give it to him. Sorry for no pictures this time, but they are currently in the new phone (which I have to figure out to get them posted). I figured it was better to send out the idea now in case you wanted to make one and post photos next week. And you add a comment if you get this? I tried to email a couple of posts to myself to I could forward them to a friend and I realized I never got them. Not sure if it is our email account with the problem or if the posts are hiding from people. thanks! Christmas Elf on a Shelf – do you do it? I hope everyone had a Merry Christmas! And since Christmas is now over I feel I can ask this: Does your family do the ‘Elf on a Shelf’? There are a couple of blogs that have been posting everything their Elf has been doing around the house and to be honest I don’t get it. Maybe it is since the daughter is in College, but even if we had little ones (other than Pepper the Golden Retriever) I don’t think we would do it. So, I am curious: Would you do Elf on the Shelf? ?